Rancho Santa Margarita, CA, April 22, 2014 – inFORM Decisions (www.informdecisions.com), a leading provider of IBM i document & payment automation solutions, announces iSign a mobile electronic Signature Capture solution. iSign digitally captures signatures from any web and java capable mobile devices including iPad, Android, Samsung, and applies them to business critical documents such as invoices, bills of lading, proof of delivery, HR documents, patient records and improving end-to-end document management and workflow. Signatures can be captured on the spot, and stored in inFORM’s iView or a any 3rd party Document Management System, eliminating the need to print and store documents. Capturing signatures immediately allows companies to increase invoicing and billing processing time and reduce the amount of paper, printing and storage costs associated with paper based processing. If using inFORM’s iView document storage and retrieval product, users can access electronically signed documents via point-n-click from any web browser, anytime, anywhere around the world. In addition digitally signed documents can be retrieved from any green screen ERP package by command. 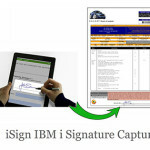 iSign Signature capture is enabled from a web java capable mobile device and works with inFORM Decisions iView document management software running on the IBM i with Apache/Zend (or can another DMS). The signed document is archived in the iView, from whence it can be searched and retrieved from any modern browser. For more information on iSign, contact inFORM Decisions at 800.858.5544. Visit www.informdecisions.com. Come for the ROI, but stay for the efficiency, security, and compliance benefits. Since the birth of the Industrial Revolution in the mid-1700s, automation efforts have proven to be one of the key catalysts of successful business growth and innovation. One of the most celebrated models of automation and business success was Henry Ford’s car company. His implementation of the assembly line is seen as the automation success model of his century. inFORM Decisions (IFD) last week unveiled iCapture, a new version of its document scanning and indexing solution designed to work with its IBM i-based document management system called iView. iCapture is an overhauled version of the vendor’s previous document scanning product, called iScan, which IFD says features major enhancements in the areas of data capture, indexing, and integration with PC-based scanners. inFORM Decisions, a software company that develops document management software for IBM’s midrange AS/400s and iSeries servers, last week launched a new suite of document management software that runs on Microsoft Windows operating systems. iDocs for NT has the same basic capabilities and features as inFORM’s iDocs Suite, with the main difference being that it reads the ASCII print datastream instead of the proprietary print datastream used exclusively in IBM iSeries and mainframe computers.